The YCE team – a friendly bunch! Join us at the front line of decarbonisation! We’re part of an international grassroots movement that is making tangible gains in the fight against climage change, and building community as we go. 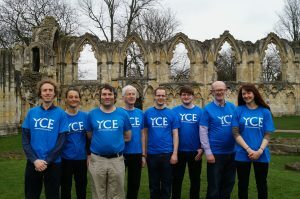 You can join online now – it’s only £2 for lifetime membership, though you can pay more to become a supporter member – and get a t-shirt to prove it! Could you help us out with our social media and/or web content? We sometimes struggle to keep the wider world up to speed on developments – hopefully you’ll agree we manage quality, if not quantity. We would love to develop educational aids and lead workshops aimed at children. We have been asked to do this in the past, but none of those currently active in YCE really has the skillset for it! If you’d really like to get stuck in, we currently have a vacancy for a Membership Secretary on our committee. It’s not particularly onerous (as witnessed by the fact that we’ve managed without since June last year) – coordinating memberships is made significantly easier by the fact that most are life memberships! Get in touch with us if you’d like to be more involved.